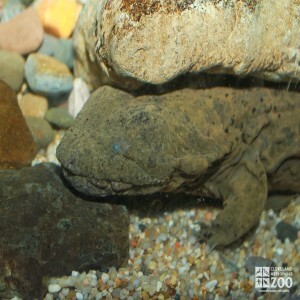 The hellbender is the second largest salamander species in the world. The length is 12 inches to 29 inches, and it resembles an eel, with a broad, flattened head and body. The female is larger than the male. The coloration is gray to olive-brown on the upper sides and back, with variable amounts of spotting or dark mottling. A wrinkled, fleshy fold of skin is present along each side of the body (this wrinkled skin increases surface area for oxygen absorption). On the neck there is a single pair of circular gill openings. The rear half of the body is ridged. The eyes are beady and inconspicuous. The legs are tucked under the body. The hellbenders range is southwest New York to northern Alabama and Georgia; Missouri east to the Susquehanna River in Pennsylvania. Hellbenders inhabit clear, fast-flowing streams and rivers with rocky bottoms. Incubation of eggs is 10 to 12 weeks. This hellbender is totally aquatic. They are solitary but will sometimes congregate into small groups. They are voiceless and are active throughout the year. They are secretive and nocturnal, remaining under rocks during the day. They can swim but prefer to walk on the river bottom. In late August to early September, the female lays 200 to 500 eggs in long strings, in a saucer-shaped nest prepared by the male under large, flat rocks or submerged logs. The male releases clouds of sperm and, with body movements, spreads the sperm among the eggs to fertilize them. Egg cannibalism does exist, even though the male remains in the nest to guard the eggs until they hatch, in about 10 to 12 weeks. The larvae then take 3 years to reach adult Hellbender appearance (The first year they double in size and the second year they lose their external gills.). It takes 5 to 8 years before individuals reach sexual maturity.